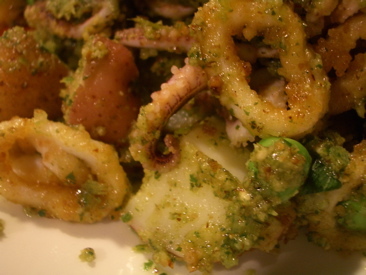 Squid with Red Potatoes, Peas, and Tarragon/Almond Pesto. I dusted the squid with roasted chickpea flour and shallow fried it in grapeseed oil for 50 seconds or so. The pesto was tarragon, roasted almonds, salt, pepper, and roasted walnut oil. It all tasted pretty roasted. 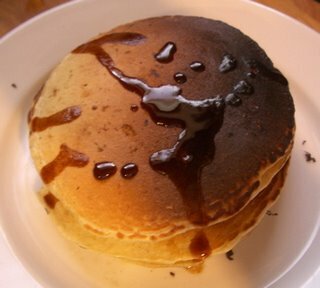 Cornmeal-Peanut Butter-Currant pancakes with Pomegranate Molasses. Cauliflower, fresh red onion, grape tomatoes fried with crushed red pepper, ground mustard, cumin. Tossed with couscous, black currants, pistachios, kirby cucumber and dill. Queen Anne Cherry Ice Cream. 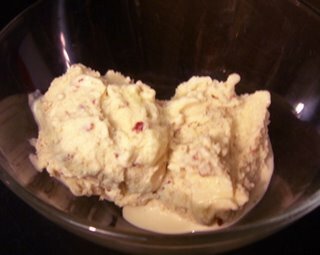 I made a crème anglais and poured it into my limping ice cream maker with pureed queen anne cherries(from Jersey!) and some heavy cream. As the photo shows, I was too impatient to let it set up enough in the freezer, but the texture and taste are very good. I put very little sugar in it so it is really only as sweet as the cherries are. Strange Lamb and Crouton Breakfast Thing with a Poached Egg. I don't know where this came from. 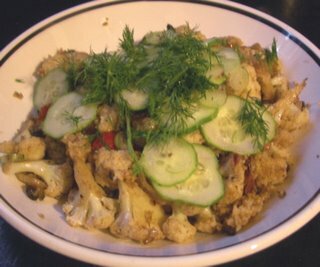 Lamb(the last scraps) and shallots sauteed in a little butter, tossed with semolina bread croutons, kirby cucumber, tarragon, almonds and smoked paprika, sea salt, black pepper. 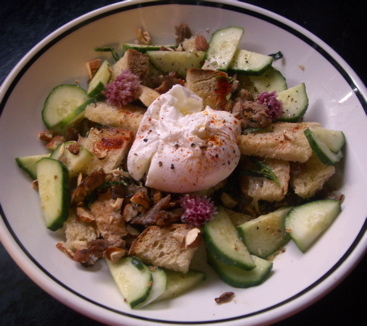 Topped with poached egg.